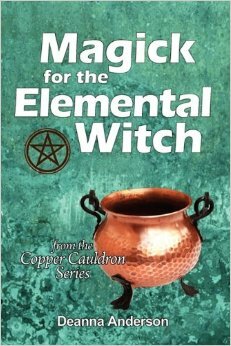 Magick for the Elemental Witch, as a whole, was a very excellent and educational book. She covered such a vast array of topics and religions. I was very impressed. Honestly, the main downfall was there were some very obvious grammatical errors, especially once you hit the middle of the book. I would easily suggest this book to anyone wanting to expand their knowledge or if you are just starting out. Anderson talks about a great variety of things and I think anyone would be able to find something useful. She gives great personal examples and also talks about different spells. All-in-all, I’m a fan. Moving into section 2 she talks about correspondences. She talks about a lot of different cultures like Celtic, Chinese, Japanese, Hinduism, Buddhism and Tibetan. After that she moves into Tarot. She breaks down what Tarot is, and the basics and even talked about a new way of reading Tarots I had never heard of. She calls it the “Universal Message”, and she separates all the suits and arcana’s, where they each have a different area in life. The wands are the working life, swords the intellect, cups is emotional, pentacles are the physical life and the Major arcana represents the spiritual life. She does tough on Dragon Magick as well in this chapter, which I personally got pretty excited about, as not too many resources touch on that. Section 3 is all about the Tools of the Elements. In the first paragraph Anderson states “… all of magick is based on a motto of “take what works for you and use it… paganism is the ideal path because of its flexibility and allowance of incorporating other ideas and influences into practice.” But, there was something she says when talking about the pentagram that I really don’t agree with. She talks about how the pentagram, when upside down is signifying materialism before the spirit and that it is used in Satanism. Now, I’ve briefly talked about this before in an old column. Allow me to quote myself. “One of the most controversial aspects of either symbol is when it is inverted. (2 points up, 1 down). It is seen as evil by not only Pagans, but Satanists, Christians and just the general public. It is often seen with a goats head drawn inside it. In my personal belief an inverted symbol is not evil at all, in fact even in Chinese Feng Shui and inverted pentagram can be used to banish. An inverted Pentacle is even used in the Gardnarian 2nd degree initiation. It shows that you need to deal with the darkness within yourself before it can rise up. Most modern day people avoid it since it is widely associated with Satanism but in historical times it wasn’t nearly as taboo and was in fact often used in banishing spells.” I personally even have some inverted pentacles tattooed on my arm. Mainly because I saw it as symbolizing the banishing of my past life, and moving onto a new life. Now, I don’t want to talk too much about myself here, and I’m sure many people would disagree, but I’m just stating my personal opinion. Reaching the last section of The Four Classic Elements, Anderson writes about working with the elements. This was one of my favourite chapters and I took a lot away from it. She speaks of Low and High Magick, and sums it up greatly by saying “An easier way to remember this is that in Low Magick means the practitioner is doing the work and the God and Goddess are merely invited to the party. In High Magick the God and Goddess are the party being asked to do the work.” I love how she talks about Cauldrons and even mentions how to make specific cauldrons for each element. You also get a feel for her personal life as she makes personal connections and mentions her family and history lots. Anderson also touches calling and dismissing the quarters. She gave me a great idea on making a new charm bag, as I hadn’t made on in years. I love that about reading books like this, is sometimes it’s just a reminder and refresher. She gives some brief information on altars. Such a wonderful chapter. She packs a lot of information and just words things well. In this chapter alone I felt this would be a good recommendation for someone just starting out. The first element she goes into is the Earth Element. There are 8 sections for this element. The first section is just a rough overview. “…to truly know the earth element is to rely on, utilize, and know intimately each of its cycles and what they can bring to us”. Then she gets into correspondences where she touches on a large number if things, and you get the feel for the format that she uses for the rest of the book. I did wish she had some pictures or drawings of some of the symbols she talks about. Luckily for me, I’m already familiar with most, if not all of these. She moves on to talk about the Tools of Earth and working with Earth. I love when she writes about the Witch Ladders. She goes into detail on how to make them and what they stand for. One section I was happy to read was all about all the different soils and salts one can work with. She even throws in a recipe on making your own bath salts, which I will be trying. Section 6 is all about rocks, stones and pebbles. Reading about this she mentions holey stones, worry stones, cornerstones and more. The next section is all about plants and trees. “ There is no harm in using natural vegetation for use in magick of mundane practices but make it a point to use what has fallen naturally, grow it for a specific use, or replace what was used.” She always mentions these nice reminders on respecting the earth and, I’m a supporter of that of course. Anderson then moves onto the water element. “…water gives life to animals, plants and humans; it is warm and relaxing; cool and refreshing; it nurtures and nourishes; it cleanses and cleans; it anoints and blesses and it is an essential element that we, as humans and pagans cannot do without.” Like I mentioned, she sticks to the same format for each element, so the first section is all about correspondences, where she explains some basic information and touches on various religions. The tools of water is next and then she moves into working with water. Which on the first page there was a sentence I really liked. “Another correspondence that may be surprising to some is that of mirrors; they are reflective surfaces like water and appear to have a depth to them like bodies of water do.” This stood out to me, as I believe she is very accurate when she writes about how not a lot of people thing of a mirror as a tool. Now, the section on sea salt and water is fantastic… except for the grammar issues again. There were a couple in this chapter, and honestly it’s a little distracting. There are wonderful points and it shows that Deanna is knowledgeable of at least four religions and is aware of their legends, mythology and origin stories. The next section as well has some major grammar issues. And it was in this section that I wondered if the book was edited at all. The information, of course, was accurate and can help a lot of beginners out. But, with grammar issues like “…but legend has it that they are doves and finding the, is believed to promote piece.” And “Maybe thee are from trees or branches that were broken….” How did ythee even make it past spell check? The section on physical and metaphysical health has a recipe on a salt base for bath salts that I am going to be trying. I love the idea of making my own rather than buying them from the store. The section all about mythology and folklore is by far my favourite. The next element Anderson moves onto is the air element. Again, she starts the chapter with a great description. “Air is our breath; it is our very existence and life. If we are sitting in our houses without water near us, no fireplace and our feet are not touching the bare earth we are still in the air element. It is all around us and is vital to our existence.” Section two is about correspondences, and section three on tools. She does a good job of explaining things in a way for new witches and a refresher for those who have been practicing for years. Section five is my favourite section for this element. It’s titled “When the wind blows” and mentions wind correspondences, wind in folklore, spells and rituals and has a fun idea about a balloon anger release and balloon wish. She writes about kites, leaves, divination and austromancy. The following section is about our winged friends. Once she starts into insects, she is writing about an experience she had with bees and there is another grammatical error. “I kept seeing bees near my when normally I would never see any…”But, this whole chapter is fantastic. She touches on so much and does a great job of wording things in an easy to understand way. After that Anderson gets into Weather magick. Now, she had mentioned before, and she touches on it again that you need to be careful while working with weather magick as you don’t want to fool around with Mother Nature. She does write about cloud scrying, which is one of my favourite things to do. I’ve always been drawn to looking at the clouds, so I was happy that she mentioned it. Getting into the mythology and folklore section she states “The creation of air is one of no creation at all. Of all the elements in this book, air is the one that seems to always have been around and was not created by anything or anyone. Fire was given to or stolen by the humans, earth was created by gods, water came from the skies or melted from glaciers, but air was always around and not created. It is one of the elements often taken for granted and yet we can only live a few moments without it.” I love this. I think she worded it well. After that she does get into elementals and has a nice variety there. Next is the fire element. “Regardless of how it is used, fire has a long history in the world and with that comes a long history of superstition, folklore and magick.” Fire is my element, so I loved reading this whole section, even though I already knew most of it. When she talks about the tools of fire in section 3, of course, the candle comes up. “Early occultists believed that the candle represented a human in that the flame was the spirit, the wick was the mind (or intellect) and the wax was the physical form. A candle can also represent all five classic elements with the flame as fire. Melted was as water, solid wax as earth, smoke as air and the spark that created it as spirit.” Section four is about working with fire and section five is all about flames and fire. The section on flames and fire is well done. She touches on a lot, and gives some older and newer information. She throws in a few spells and rituals and the chakra spell is one I will be trying. I’m surprised I haven’t thought of doing it yet. Deana touches on ashes and smoke in the next section and mentions believe it or not… the boy scouts! She moves into a section called “Fire in the Skies” which mentions things like meteors, the sun, stars and lightening. Again, more grammar issues, like putting the word starts instead of stars. Anderson touched on fire mythology, which is a great section. I personally really enjoyed when she talked about the phoenix. Section five is all about “The Incorporeal Soul” and is about ancestral worship. Sabbats, spirits. And divination. My favourite topic in the spirit element is about animism, which is something I feel strongly about. “Animism is a widely accepted belief system that follows a doctrine that everything in nature, either animate of inanimate, has a consciousness or soul.” She writes about some spells, totem poles, spirit houses, effigies, and again, divination. All in all a very informative chapter. The second last section is about the hidden realms, which is sometimes called the Otherworld. She touches on some magick that just seems fun and sometimes I will be looking into more. Can you guess what the last section is about? Mythology and folklore of course. Again, some great points are made and she shows her knowledge of various religions. Overall, this book is a great read. I would strongly suggest this book. Literally, the main negative thing I have to ding it for would be the grammar and spelling. I would suggest people just starting out in the pagan/wiccan path read this book. It’s filled with wonderful insight and she touches on a vast array of topics, and the format of the book was well planned. I will be looking to read more from the Copper Cauldron books, and hopefully the grammar is better. Deanna Anderson knows her stuff. I’m very fortunate to have gotten the chance to review this book and I hope I did it justice. Deanna Anderson is an accomplished author who has written several books on subjects that are relevant to the modern pagan. Recently, I had the opportunity to read her book titled Magick for the Elemental Witch. This book covers a topic that is essential to any magickal practitioner,working with elemental energies. Every witch learns, with her/his first circle, how to call forth and honor the elements. In reading this book I was very impressed by the amount of well researched information that the author presented. Not only does she cover traditions within the long and diverse history of paganism, but she also discusses traditions that span cultures across the globe. I was impressed with the thoroughness with which the author presented the information. For the traditional elements; earth, air, fire, water, and Spirit there is a section where each is explored at length. It begins with a historical overview of the element in question. This section is followed by several rituals and exercises that the practitioner can use to deepen their work and understanding. I found that the rituals not only interested me, but they inspired me in my work with the elements. It is my belief that the basics are important to revisit regularly, as any practice is only as strong as is the foundation. This book is not geared only for a beginner or neophyte, but has information that is well organized and presented and can help any level practitioner in their practice.